Stretch your dollar and fun at these best quick service Disney World restaurants! If you are like us and love a Disney Food post, you will enjoy this post! 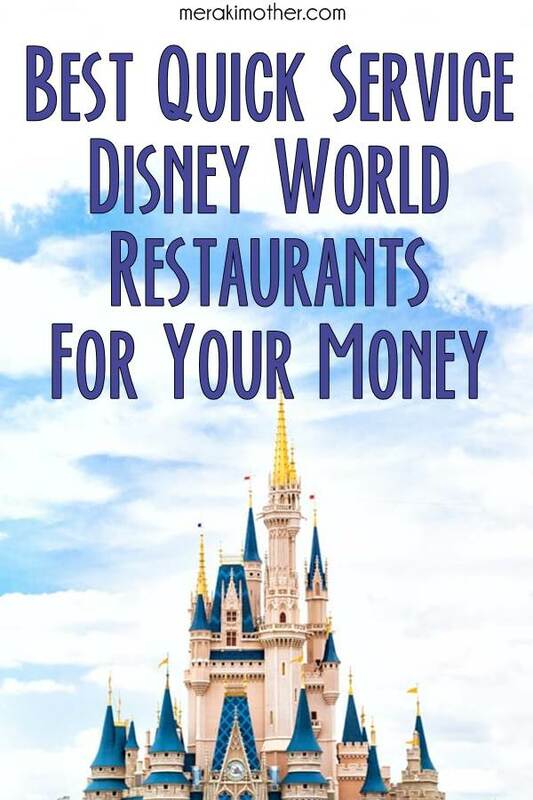 Quick Service is the best way to stretch your dining dollar while in Disney World. 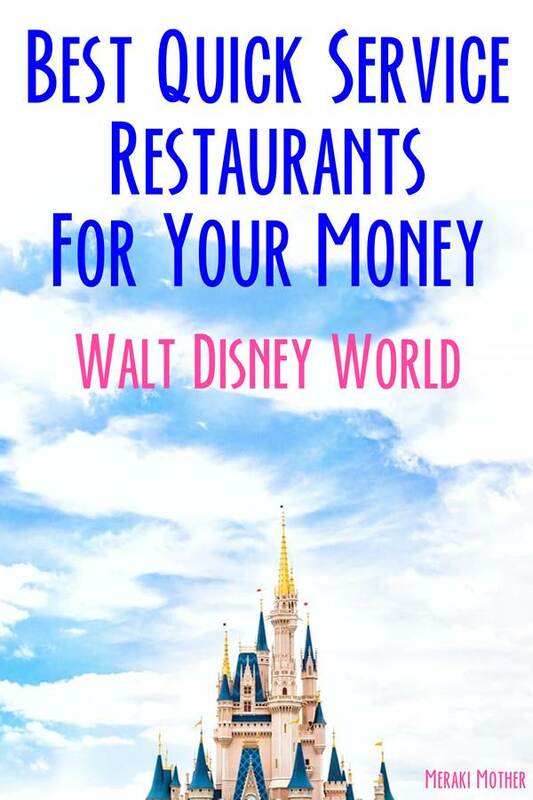 If you are looking for more information on Walt Disney World quick service dining plan just keep reading because I have some great tips for you. Some places are overrated or over priced, but others give you much more than you expect for the money, and when you have pre paid your meals with the dinning plan you can make the most of your credits in the best restaurants! Get the best dining value in Walt Disney World quick service restaurants by going to these five great locations. Enjoy great food and better portions that go a long way. While it might not always make sense, look for opportunities to share larger dishes so you can save even more or dining plan credits and use your credit on another meal or snack somewhere else. So ready to get great food and be fully satisfied with Disney quick service meals? Read on for the best tips to enjoy your quick service dining plan! Our list includes the very best Disney quick service restaurants, for different Disney parks. 1.7.1 What is a quick service dining at Disney? 1.7.2 How to get a Disney dining plan? We have made a list to help you find the best quick service meals at Disney World, wherever you plan to go today! This Magic Kingdom eatery is larger than life as the name suggests. A perfect place to get quick service meals in Magic Kingdom. The building has a lot of dining space to accommodate huge crowds, unlikely other Magic Kingdom quick service restaurants. It is very atmospheric which is an excellent bonus, but the real draw is the food value. If you love Tex-Mex, the Pecos Bill’s Magic Kingdom quick service menus will be perfect for you. The counter service location offers large portions of Tex-Mex cuisine and is bolstered by a toppings bar full of added accouterments to enhance your plate at no extra charge! With all of these advantages it is easy to see why Pecos Bill is one of the best places to eat in Magic Kingdom quick service dining plan. The only disadvantage is that if you are looking for quick service breakfast in Magic Kingdom, this is not going to be the place. To summarize, if you are looking for quick service meals at Magic Kingdom from venues that accept 2018 and 2019 dinning plans, then Pecos Bill Tall Tale Inn and Cafe is the place! Find this restaurant’s location on google maps. Related: Check out our fave Mexican food posts: Yummy Guacamole, Chicken Fajitas and Steak Fajitas recipes! This quiet Animal Kingdom quick service barbecue hut overlooks the water from the Asia side of Discovery Island. This is a great place to get shareable plates like the Ribs and Chicken Combo, the Baked Macaroni and Cheese with Pulled Pork, or the French Fries with Pulled Pork and Cheese. By doing this you can have a filling lunch for two for less than $30. Definitely a good value Animal Kingdom quick service restaurant. If you are looking for quieter quick service meals at Animal Kingdom, we would definitely suggest you to visit the Flame Tree Barbecue. With all that in mind we have rated this venue as the best quick service at Animal kingdom. Flame Tree Barbecue does accept 2018 and 2019 dinning plans so perfect if you are looking for quick service dining at Animal Kingdom. Click here to see this restaurant’s location on google maps. When the idea is to do as much as possible why not to get some value priced lunch at a counter service? Big kid sandwiches are finding their way into Andy’s packed lunch (and beer for some reason?). This new Hollywood Studios quick service spot in Toy Story Land at Disney Hollywood Studios features loaded tots, creative sandwiches, and a tasty dessert that resembles a toaster pastry. The proportions and the level of ambition in the food of this counter service venue are way more than the pricing indicates. You can get yourself a Grilled Three Cheese Sandwich, Tomato Basil Soup, and a Lunch Box Tart of your choice for around $16. It s also a perfect place for delicious breakfast. For all these features we rate Woody’s Lunch Box as Hollywood Studios best quick service for your money. Find Toy Story Land where this restaurant is located here on google maps. Looking for Disney Springs quick service restaurants to enjoy your dining plan credits? You don’t have to splurge to get a taste of the Iron Chef’s cuisine in Disney Springs. The Quick Service counterpart to Morimoto Asia is bursting with great flavor at a reasonable price. Any of the bites offered on the menu are high quality and very tasty. It’s a huge value for the money, especially if you are a Morimoto fan. You can also enjoy quick service meals at Disney Springs with your dining plan because Morimoto Asia Street Food also accepts 2018 and 2019. With all that said, we rate the Morimoto Asia the best quick service Disney Springs restaurant for your money. For this restaurant’s location, check google maps here. Looking for the best Epcot quick service dining spot? There are three Epcot mexico quick service eateries with the name San Angel in the Mexico Pavilion. The San Angel Inn Restaurante is the table service location inside the temple that overlooks the Gran Fiesta Tour boat ride. La Hacienda De San Angel is the table service dinner location outside which shares a building with Cantina San Angel, one of the best Epcot quick service restaurants for value. While La Hacienda De San Angel is closed, you can take your counter service quick service meals at Epcot inside the beautiful dining room that overlooks the World Showcase Lagoon. That adds value on top of the great tasting food at a lower price point. For all these advantages we rate Cantina San Angel as the place to get the best quick service meals at Epcot. Find this restaurant’s location on google maps here. 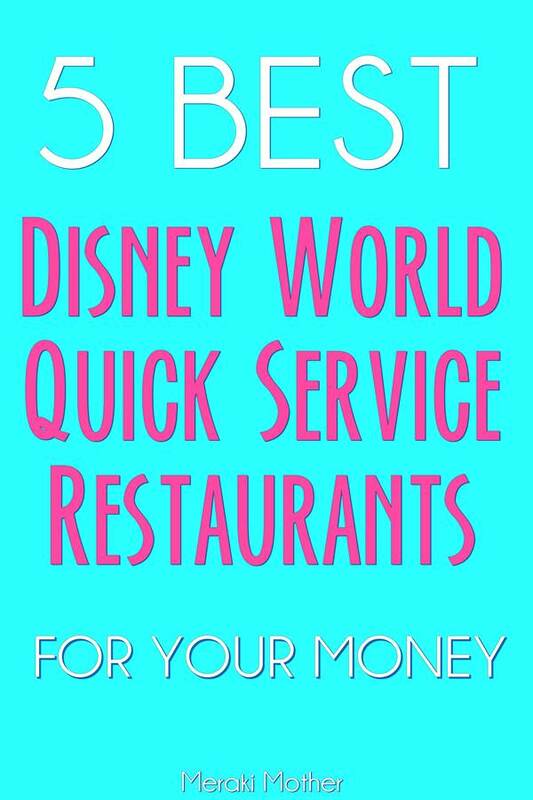 Now that you know which ones are the best quick service restaurants at Disney World, it is time to start planning and/or booking! Below I list some quick info and tips if you still have questions about quick service meals at Disney World or their dining plan in general. To make the most of your dining plan you should plan your meals in advance so you spend your credits wisely and don’t leave them all to be spent at the last minute! You can also save during the Free dining plans deals, they hold deals for selected dates, check this page here for more info. What is a quick service dining at Disney? Going to WDW and wondering; ‘what is quick service?’. We can help you here. A Walt Disney World quick-service venue is a restaurant or cafeteria that offers fast service for your food. It is generally a counter-service venue where you order what you like, pay and go sit to enjoy the meal. However there are also options for dinning experience with table service (the standard and deluxe dining plans). How to get a Disney dining plan? 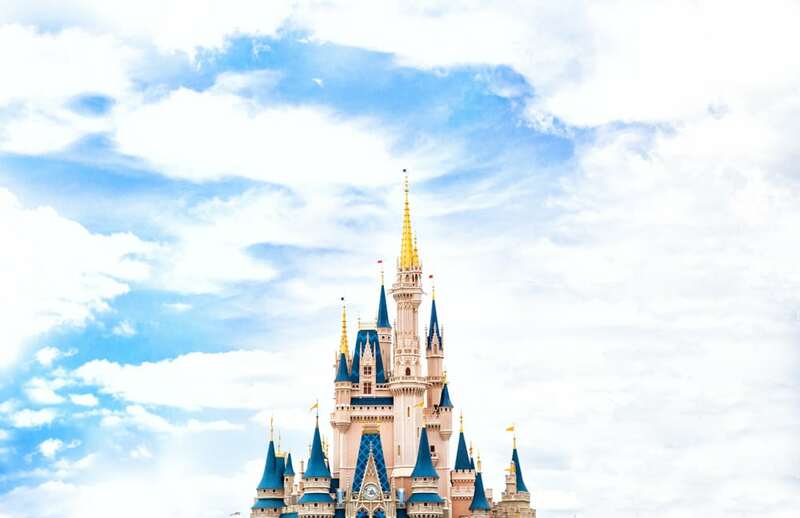 Thinking of booking a Disney vacation? When doing so you can choose to purchase a Magic Your Way Vacation Package that includes one of Disney’s Dining Plans. The dining plans are different and provide entitlements for you to redeem at the select venues in WDW who accept dining plans. For more info about the dining plans, please check this page here. Also keep an eye on this page here for deals where you get your dining plans for free on selected dates.